At this time of year, we often hear holiday songs…on TV, on the radio, in stores. The music helps set a mood, puts people in a happy mindset (hopefully) and creates a special, once-a-year feeling of community and togetherness. At Camp Young Judaea, music does many of the same things…and more! Music defines and enhances camp and literally is the soundtrack of our summer experiences together. Singing together at camp means you don’t have to worry about having the greatest singing voice or even knowing all the words. It’s about being a part of our community and having fun! Even campers and staff who don’t normally do much singing find that they love music at camp! And people who DO love singing or playing musical instruments find tons of opportunities to participate. Whether it’s songs with nonsense lyrics, songs with hand motions, songs that you’re belting out at the top of your lungs, songs at services, team songs we write and perform during our Maccabiah (Color War), songs where everyone joins hands together, songs performed with your bunk at our annual Rock Pantomime competition or Shir Rikudiah presentation, or songs where one age group is trying to out-sing another age group, music brings us all together at camp. Within a very short time, everyone learns the words and the tunes and suddenly…something amazing and magical happens! If you’ve been to CYJ, every time you hear “Lean on Me” or “Salaam” it reminds you of being at camp. Maybe you sang that song in music classes, or in song sessions where everyone is so filled with ruach (spirit) they are jumping up and down and dancing and singing at the top of their lungs, going crazy. Maybe you sang along in music classes, doing traveling musical serenades throughout camp. You might have heard that song during an evening activity, like a camp play or our counselor version of “Unplugged” or learned it during a rainy-day song session. 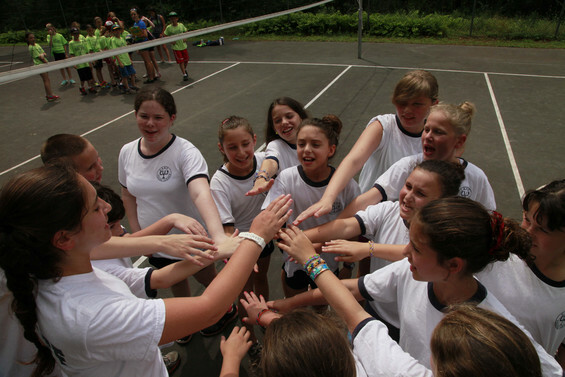 When you hear “Wagon Wheel” or “Ha-geshem” or “Build Me Up Buttercup” or “B’tzelem Elohim” you are literally transported back to camp, remembering your friends and bunkmates, great counselors and life-changing, outstanding camp experiences. Talent shows, camp plays, jamming with friends, guitar and drum lessons, musical performances and rockin’ dining hall song sessions…music literally brings so much fun and spirit to camp that it’s truly amazing! From the first day of camp–when the counselors serenade the campers with a welcoming song–to the last night, when we all watch a bonfire together and link arms and sing goodbye songs like “Leavin’ on a Jet Plane” and “Stars in the Sky”, music frames, enhances and defines our time together at camp. When I (Marcy) was a camper at CYJ (yes, a LOOONNGG time ago), I was kind of a quiet, unsure person. At first, I wasn’t sure I even really liked camp! But four days into camp, our entire bunk performed a song on stage (it was called “Mairzy Dotes” and is a really silly song). I didn’t worry about my singing voice (which campers will tell you now is…er…weirdly memorable and mostly off tune) and I didn’t worry if our outfits were weird (I think I might have been dressed up as a sheep). What I remember is looking down at all those smiling faces in the audience and realizing I was in a place where I belonged, where people supported and encouraged me, no matter what. I know it sounds crazy, but it gave me incredible confidence, not only about getting up on stage again, but about trying other new things at camp like waterskiing, being more outgoing and making more friends. CYJ became my home away from home and has stayed that way ever since! I know that Jamie Segill, my co-director who started at camp when she was seven and has been here every summer since then (!) says that CYJ is the place where she made her best friends in the world. Like me, Jamie has fantastic memories about her many summers at CYJ. And we’re DEFINITELY not the only ones!!! Our camp has been around for almost 75 years, so tons of people who have gone here as campers and counselors feel the same way about CYJ. Whether it’s arts and crafts, archery, outdoor adventure, drama, sports or swimming, there are so many fun, incredible, new things to do that will help you discover who you REALLY are and can be. Music is just one way that CYJ works its magic. At Camp Young Judaea, although we all come from different Jewish backgrounds, different places and experiences, music brings us together in a powerful and meaningful and most of all, fun way. At this time of year, while some people may have holiday songs in their heads, we have camp songs in our hearts, counting the days until we’re all back at 03031 in New Hampshire. If you’re already a camper at our camp or another Jewish camp, What’s YOUR favorite camp song? What do YOU love about music at camp? And if you’re thinking about coming to camp for the first time, what songs do YOU want to learn or maybe even bring to camp so we can sing them with you?